We do ask you to pay for your children’s evening meals. The price is geared to the age of the child and ranges from 72€ – 96€ per week. 0 – 6 months infant formula can be provided at cost, or you may prefer to bring your own if you have a favourite brand. 4 months to 1 year – Baby food provided at cost if required or as above you may prefer to bring a favourite brand to be sure of getting it. Of course, we can always blitz veg or other food to make a home-made baby mulch! Just let us know. 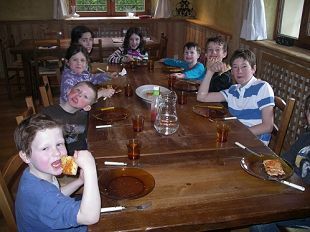 The meals include breakfast (we will try to get their favourite cereal but can’t guarantee it! ), afternoon tea and a 2 course evening meal. We are more than flexible in terms of the children’s menu: from home made pizza and pasta to the ever popular home-made chicken nuggets and sausages not forgetting plenty of fresh fruit and vegetables, yoghurt and other tasty treats. You tell us what they like and we’ll do our best to find it and cook it! On one day of the week there is no evening meal provided. This is usually on the Wednesday so you will need to feed your children (and yourself) on this day. Most restaurants and cafes provide excellent children’s meals/menus so you will have no problem. Shown below are a couple of photos taken a couple of years ago. 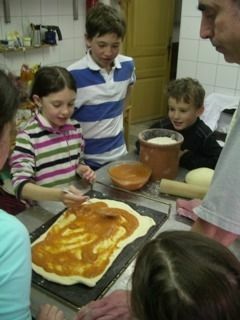 The first shows the children making their own home-made pizza for tea. The second shows them enjoying eating it!